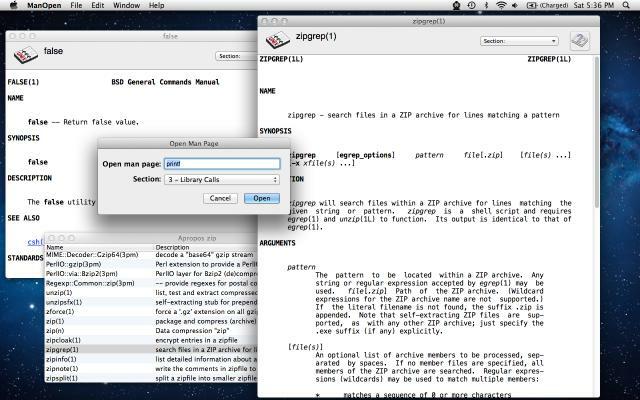 ManOpen is a MacOS X GUI application for viewing Unix manual pages, which are the standard documentation for Unix command line programs, programmer libraries, and other system information. It can open files directly or be given titles, in which case it will display the output from the `man' command-line program. An apropos interface is also provided, which is basically a quick-and-dirty search of the man page databases. Services are provided to other applications to open selected files/titles or do apropos searches using the selected text. ManOpen can be useful for opening a man page without dropping down to the command line, browsing and searching through long and complex man pages, or simply for printing them out. Also included is an `openman' command line tool, which is similar to man except it will display the man pages in ManOpen.app instead of directly to the terminal. Well, one screenshot anyways. There is a small version (about 50K) and a full-size version (about 170K). ManOpen requires MacOS X 10.4 and higher (including Lion); it is compiled to work on both Power PC and Intel Macs. Source code is also available. Older versions ran on MacOS versions prior to 10.4, MacOS X Server 1.2, and OPENSTEP/Mach machines. To install the app, first unpack the distribution. A .dmg disk image is provided. Unpacking the distribution should create a directory with a README, the ManOpen application, the openman command-line tool, and openman's man page (openman.1). Place the application in one of the standard Application directories, such as /Applications, /Network/Applications, or ~/Applications. If you want to install the openman tool, put it in one of the directories in the Unix $PATH, such as /usr/local/bin or ~/bin. Put its openman.1 man page in a standard man page directory, such as /usr/local/man/man1. The current version is 2.6. No longer declares 1, 2, 3, 4, ... , 9 file extensions as man pages. This caused problems on some systems. Page loading got slower under MacOS X 10.4.2; this should be fixed. Handled some cases where UTF8 sequences appeared in the man page and were not displayed properly. Add support for the 'n' man page section, (ab)used by Tcl for its man pages. I'm always interested in bug reports, suggestions, comments, or any other feedback (and I'd like to thank all those who have written in so far). I can be reached at lindberg@clindberg.org.